I am often asked to give advice on energy saving options in the showroom. For some reason, most people associate the compact fluorescent lamp (CFL) as the only viable option in their endeavour to save money and reduce emissions. Energy saving can best be described as the most energy efficient option for the application and under the circumstances. It would be unreasonable to fit large CFL lamps to a glorious crystal chandelier where the lamps are in view. Similarly it would be sheer folly to try and light a football stadium using CFL lamps for their next evening fixture. This article is designed to inform you of the energy saving options currently available and likely to be available in the future, together with an indication of the benefits to you. European legislation has been in place since 2009 that introduced a phase-out program and additional legislation in relation to the use of incandescent light bulbs. This legislation introduced certain requirements that prevent the manufacture, sale and supply of certain lamps. From 2013 all clear light bulbs over 7 watts will need to have an energy efficiency rating of at least ‘C’. This means that all incandescent lamps over 7 watts are effectively banned. It also means that all halogen lamps such as G9 and G4 must be at least ‘C’ rated. There will of course be a transitional period during which time both types of lamps will be available and this is permitted under the regulations. ‘C’ rated halogen lamps already exist and will be discussed later in this article. There will be further improvements introduced in September 2013 and again in September 2014. The commission will review progress and review future requirements taking into account any new technologies or developments in the recent past. New more energy efficient lamps are becoming available that utilise the latest technology and this will continue to be the case. The current options available to you fall broadly into the following categories. Nowadays, you can buy a wide range of low energy light fittings that will only take low energy light bulbs. These use a high frequency ballast or transformer fitted into the back plate of the light fitting. It controls the supply of electricity to the lamp or tube, allowing for a small surge of power for a millisecond to light the lamp and then reducing the electricity flow to a very low level. Dimmable low energy light fittings are also now available. The humble fluorescent light fitting is an excellent example of a dedicated low energy light fitting. It is unfortunate that through personal experiences of the old style fluorescent fittings they have fallen out of favour. Fluorescent tubes have come a long way as have the fittings themselves. Nothing gives the same light quality and longevity in the same price bracket. Dedicated low energy pendant fittings are now common place in new build homes that comply with the new energy efficient building regulations. They take a three-pin energy efficient lamp that is rather expensive to buy for no perceivable advantage over an ordinary compact fluorescent lamp. The three pin configuration ensures that only an energy efficient lamp can be used and will ensure that the bulbs you buy in future will always save energy, money and the environment. 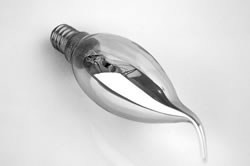 Dedicated low energy fittings typically consume around 20% of the energy that a traditional light fitting would use for the same output and last 10 – 15 times longer depending on the type of lamp used. Put another way, they represent an 80% energy saving. These fittings are normally marked with the symbol L1 or L2 and use specialist lamps of differing shapes and pin configurations. The energy saving trust estimate that if you fit all the lights in your house with energy saving bulbs you could save £675 over the lifetime of all of the bulbs. In the UK alone it has been estimated that using energy saving lamps will reduce the amount of carbon dioxide released into the atmosphere by 2.3 million tonnes a year. If the whole of the EU switched to energy saving lamps it would represent a reduction of 30 million tonnes a year. There are now more energy saving lamp options than ever, some good and some great but it is important to remember that each type has different characteristics and gives a different type of light. This section outlines some of the advantages and disadvantages of each type. This type of CFL lamp is available to suit all of the commonly used lamp holders and suitable for use in any type of ordinary light fitting that uses the ES, SES. BC or SBC lamp holder. They are best suited to fittings where the light bulb cannot be seen such as glass fronted wall lights, pendant lights with a shade, outdoor lights with an opal diffuser or any traditional light fitting with shades. This type of lamp is a fluorescent lamp with its own ballast fitted in the base. They are available in a standard turn or spiral. The fluorescent spiral lamp is very compact and can be used where space is limited. Gone are the days when it took a minute or two for the lamp to reach full brightness. The current CFL lamps reach full brightness within a few seconds. Some people get confused as CFL lamps are available in many colour temperatures. A lamp marked 827 or 2700K will give a warm light very similar to an old style incandescent light bulb, whilst an 835 or 3500K will give a whiter colder light for a more contemporary look. Any fluorescent lamp approaching 5000K and over are referred to as daylight bulbs as they are very close to the light given by the noonday sun. They have excellent colour rendition and are very well suited for use in task lamps. So what do the numbers on a CFL lamp mean? Some have the colour temperature written on them in Kelvin, for example 2700K (warm white), whilst other just have three numbers, for example 827. The first number specifies the colour rendering (CRI) index of the lamp in tens of per cent and the second number represents the colour temperature measured in hundreds of Kelvin. For example, a lamp with a CRI of 85% and a colour temperature of 2700 kelvin would be given the number 827. All CFL replacement lamps can save you up to 80% in electricity and will last at least ten times as long as a standard light bulb, saving you money from the moment they are fitted. Please note: This type of lamp is not suitable for dimming and must not be used with any type of dimmer or in a touch lamp. Replacement LED lamps represent the very latest in energy saving technology and are the current ultimate energy saving alternative. The LED light bulb is the cheapest to run and offers remarkable lighting levels for very little energy consumption. They are extremely efficient, typically saving 90% in energy over a halogen light bulb. There are an ever increasing number of different types of LED lamps available including the more common types such as candle and golf ball lamps. GU10 LED spot lamps are very popular and now offer real benefits when compared to a 50 watt halogen lamp. There are now dimmable versions available that have excellent colour rendition and very high output. A 5w LED GU10 replacement lamp gives almost the same amount of light as a 50w halogen light bulb, whilst a 7w version gives at least the same amount. Our LED light bulbs are ultra reliable, generate very little heat and can typically last 12 – 15 years in the home, up to 20 times longer that a halogen GU10. Many LED GU10 spot lamps use SMD (surface-mount device) technology. These are much cheaper to produce and typically have a number of smaller LED lamps mounted on the surface of a small PCB (printed circuit board). They give excellent lighting levels but generally produce fewer lumens per watt. Great care should be taken when buying a replacement LED lamp as they are not all of the same quality. Choose a quality product with a good history of research and development; using high quality LED’s or SMD arrays and you will reap the benefits with reduced electricity bills for many years to come. It is not cheap to change all of your lamps for LED, however Changing a 50w halogen lamp for a 7w LED lamp will save you over £125.00 during its lifetime through reduced energy consumption alone (Based on 12p per kWh). This takes no account of replacement lamp costs estimated at 20 lamps during the lifetime of the LED lamp. To put this into context, if you have an eight-light chandelier with 25w lamps installed, it would cost you £144.00 to change to our 4w LED candle lamps. Over the lifetime of the LED lamp you would save at least £495.00 in electricity costs alone, (Based on 12p per kWh and an average of three hours use per day). This takes no account of replacement lamp costs, which at current prices would amount to an additional 50 lamps at £1.40p each. Energy saving halogen lamps are designed to achieve a 30% energy saving compared to a traditional incandescent lamp. They look the same but last up to three times as long and save you energy and money. They are fully dimmable, give an instant crisp white light and can be used as a direct replacement for all types of normal household light bulb. They have a lower initial purchase cost than the alternatives and last for up to 2000 hours. They give the same light as their outgoing counterpart yet consume 30% less energy. A 40w candle lamp equivalent will consume between 28w and 32w for the same light output depending on manufacturer. A 60w replacement will consume around 42w. The halogen adaptor light bulb is a modular lamp made up from three parts. The base is available in BC, SBC, ES and SES to cater for all of your home lighting needs. The base screws into the light fitting and takes a normal ‘C’ rated G9 halogen capsule. This is then covered with the lamp cover of your choice; for example, a candle lamp or golf ball available in a variety of finishes including opal and tinted. The adaptor can be used over and over again; you only need to replace the halogen capsule when it fails. There are many advantages to using an adaptor lamp over other forms of light bulb? With a typical initial purchase cost of under £5.00 including the halogen lamp and low replacement capsule costs, these energy saving alternatives to the incandescent light bulb will pay for themselves in a very short space of time. It should be noted that all halogen lamps run hot when they are lit. Great care should be taken to ensure that they cannot be touched when in use, particularly by young children. Whilst these are not as efficient as a CFL lamp, they are ideal in situations where the lamp can be seen or in crystal light fittings. The clear lamp and crisp halogen light give excellent colour rendition and will cause crystals to sparkle. For almost 100 years, the light output of light bulbs has been given in watts, yet wattage is a measure of heat, not light output. As a child I remember my grandfather putting a 100w lamp in the outside toilet to stop the cistern freezing during the winter, and a good job it did too. The reason is that the lamp was giving off 100w of heat and that was enough to raise the air temperature above freezing. If I asked most people how much light a 60w lamp gave, not many would know the answer. Most people would be able to tell the difference between a 60w and 100w lamp simply because one is brighter than the other, but what happens when a 20w lamp is brighter than a 60w lamp? How do we know how efficient or bright each lamp is? This is where lumen output is invaluable as it gives a precise answer to the question ‘how much light will this give’? All lamp manufacturers are now required to state the number of lumens on their packaging. Although there are still a few that do not provide the lumen output, this should resolve itself over time as new lamps are produced and old stock is sold off. The table below shows the relative output of each lamp type in relation to the old wattages. All manufacturers vary slightly, so this table should be used only as a guide. This table shows you the potential energy savings by choosing different types of lamps for a given light output and should help you in making an informed choice. It is clear that we can all save energy, save money and reduce emissions by simply changing the type of light bulbs we use in the home or at work. This article was designed to enable the reader to be better informed in relation to what is available and the benefits of changing to each type. If there is anything that you do not understand, is not contained within this article or you simply require further information or advice, please contact us and we will be happy to answer any questions you may have. Please follow this link to download this article in pdf format (opens in new window) so that you can read it at your leisure.